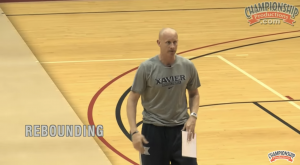 This video is with Xavier’s Chris Mack coaching a rebounding drill that he describes as an attitude drill. Split your team into two teams. Pair players to compete against each other who are similar in size. The team that wins the most one on one rebounding battles is the winning team for the drill. To add an element of pressure to any drill you run, make the winning team “validate” their win by making a free throw. Choose one player to shoot the validation free throw. If he or she misses, then the losing team gets a chance to become the winning team by making a free throw. You might not like how much physicality Coach Mack allows in the drill. You will need to decide if you want to only allow contact that would be allowed in a game, or if you will allow more. The video is 4 minutes long.